Congratulations to the RSGA Xcel Gold team on an amazing 3rd place win at the 2018-2019 State Gymnastics Meet! So many of the gold gymnast had new personal best’s, top five on an event or in all-around. Leading the gold team to their trophy was Ella K., Brynna S., Viva S., Ellen S., Alex W., Katie S., and Kaia B. 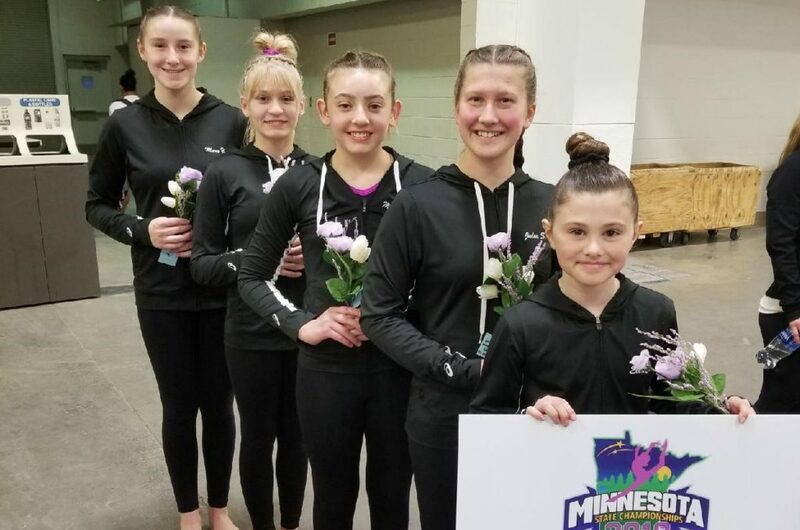 The gold team is excited to have a small break in their season to get ready for the last meet, which is Xcel Region 4 Regionals at the end of April. Good luck at regionals and great job on finishing up your regular season in such a strong way! We are so proud of you all! Congratulations to the Xcel Platinum and Diamond level gymnasts that competed at the Rising Stars Meet! Congratulations to Bella G., and Elise K. on a fantastic meet. Both teams had personal team best with the platinum’s getting a team score of 108.3 and the diamonds getting a 101.65. We cannot wait to rock it at the state. Good luck girls! 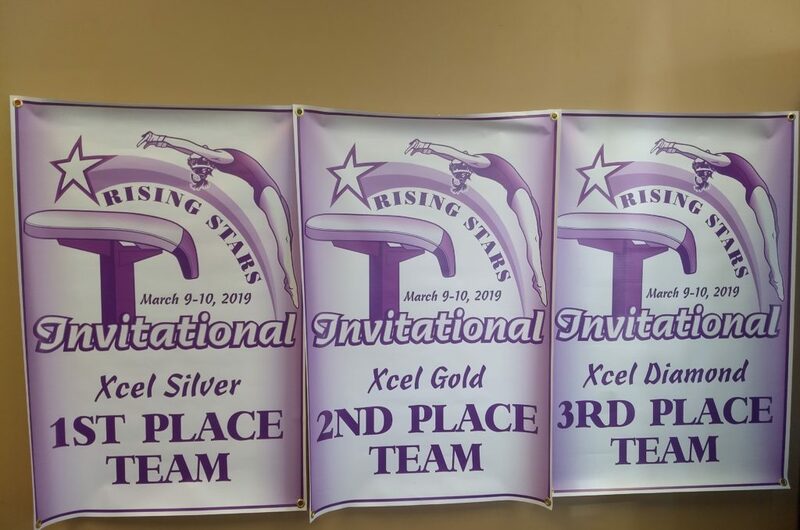 Congratulations to the Xcel Gold level gymnasts that competed at the Rising Stars Meet! Congratulations to Alex W., Katie S., Katie B., Amanda H., Kaia B., and Makiah A. on an amazing meet! The gold level gymnasts are very excited to compete at the state meet this weekend. We cannot wait to rock it at the state. Good luck girls! 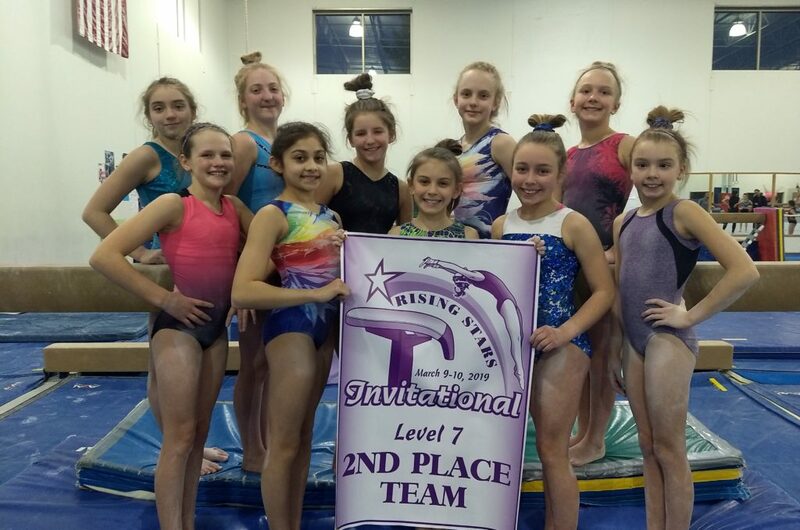 Congratulations to the Xcel Silver level gymnasts that competed at the Rising Stars Meet! The Silver gymnast had their best meet of the season! They won the meet with the highest score all year with a 114.1. Congrats to Kaleigh S., Piper F., Rylann B., Peyton P., Chloe G., Lahna S., for taking first or second in their age divisions. We would also like to congratulate Meryl C., Mimi S., and Veda C., on personal bests at the meet. A huge congrats to the whole silver team. We cannot wait to rock it at the state meet next weekend! Good luck girls! Lily T. had a great meet, winning 1st place on bars with a score of 9.15! She placed 4th in all-around with a score of 34.925! Angela T. had a great meet, placing 3rd on vault with a score of 8.425! She earned her highest score of the day on floor with an 8.8! Anna M. had a great meet, winning 1st place on floor with a score of 8.85! Breanna J. had a great meet, placing 4th on vault with a score of 8.775 and on bars with a score of 8.875. Her highest score of the day was on beam, earning a 9.0! She placed 3rd all-around with a score of 35.6! Hannah W. did awesome, earning her highest score of the day on floor with a 9.0! Sophia M. won 1st place on vault with a score of 8.85! She earned her highest score of the day on floor with a 9.05. Maddie S. had a good meet, earning her highest score of the day on beam with an 8.7. Miranda B. did wonderful, earning her highest score of the day on floor with a 9.15. She placed 5th all-around, with a score of 34.7! Madeline H. had a great meet, earning 5th place on vault with a score of 8.675! Geneva R. did awesome, earning her highest score of the meet on vault with an 8.35! Makayla B. did an awesome job, earning 2nd place on bars with a score of 9.15 and 3rd place on beam with a score of 8.975! She earned 2nd place all-around, with a total score of 35.325! Clara O. had a great meet, earning her highest score of the day on floor with an 8.75! She placed 6th all-around with a score of 34.125! Rising Stars is OPEN for classes! If you will miss class, due to Spring Break, you may use your make up and schedule it with the Office at any time between now and the end of Spring 1 (April 20th).